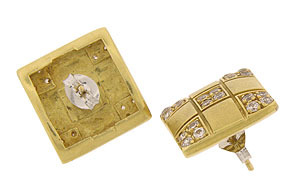 These distinctive 18K yellow gold vintage earrings are set with sparkling round diamonds and mounted on posts. The satin finished surface is separated into squares by deeply carved channels. 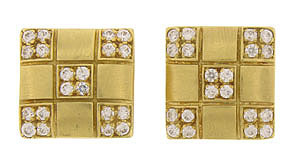 Alternating squares of faceted diamonds and gold adorn the softened square face of these handsome earrings. The earrings measure 9/16". Circa: 1940.